guess what?!? : Dinner at home - halloween! Dinner at home - halloween! We had friends over for dinner the night before Halloween, so I decided to make the food a little halloween themed. but only a little! 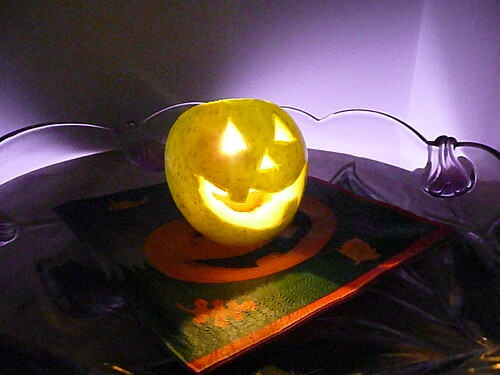 I wasn't paying $20 for a "carving pumpkin" at Woolworths, so I carved an apple instead! A tea light fitted nicely inside. 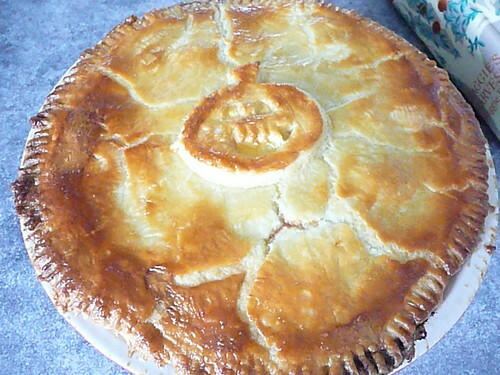 For dinner, I made this beef and bacon pie. I uses Maggie Beers Sour Cream Pastry. It was easy to make - it just goes together in the food processor. The filling for the pie, I made up. I sauted a leek, then added garlic, and chopped up meat. I think I used blade steak. Not really a meat expert here - it had a bone in it, which I cut out and used to make some meaty stock, which I added to the browned meat with some tomato paste. I simmered the meat on a low heat for a few hours, until it was really tender and falling apart, and the gravy was thick. Then I left it overnight to cool in the fridge. The next day I shredded the meat up a bit with a fork. I rolled out the pastry and lined my pie dish with it, then put it back in the fridge to harden up, I then filled it with the cold meat filling and put a pastry top on. I then put it back in the fridge to cool again. I btushed the top with egg wash and baked in the oven for 20 ish minutes, until nicely golden brown. I served the pie with some assorted roasted vegies, which is what I ate for my dinner. dessert was a slight drama. I made a kind of chocolate mousse-y thing using condensed milk, cream and cocoa powder which I beat together, and put into cups with a suprise of caramel in the middle. Then we went and bought a new fridge, and in the excitement of getting the new fridge delivered, I left the dessert in our old fridge, which was taken away by the delivery man. Oops. So a quick new dessert was needed. 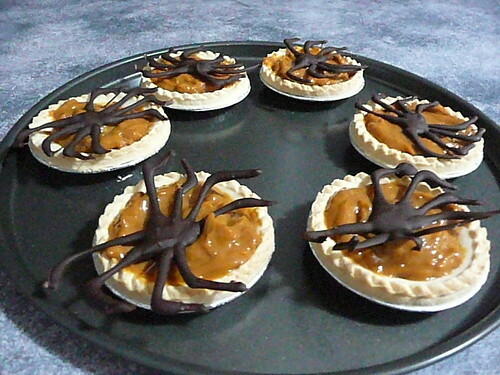 I had already made these chocolate spiders to put on top of the mousse, so I zipped down to the IGA and bought some ready made tart cases which I filled with the left over tin of caramel. And there we have a super easy, and rather tasty dessert. I am still cranky at myself for leaving my Ikea cups filled with dessert in that fridge. Have to go to Ikea to get some more cups!! !